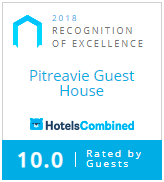 The Pitreavie Guest House is surrounded by many world famous visitor attractions. We are extremely proud of our historic surroundings and as such we have put together a small introduction to the attractions that can be found in and around Fife. Our home town of Dunfermline itself is full of many sites of historic interest. Dunfermline is the ancient capital of Scotland and is famous for being the burial ground of King Robert the Bruce and the royal conenctions do not end there as the town was the birthplace of both James I and Charles I and is the burial place of 11 Scottish Kings and Queens in the area of the 12th century Dunfermline Abbey and Royal Palace. The City is the birthplace of industrialist, businessman and philanthropist Andrew Carnegie who gifted the people of the town many life changing facilities including the Pittencrief Park, The Carnegie Hall and the Dunfermline Library to name but a few. The Carnegie Hall is very much part of the heritage and history of Dunfermline. It offers a wide variety of show including Drama, Comedy, Music and Dance. It also boasts quite a few live music venues . Old favourites such as “Monty’s & P.J Molloys has been part of Dunfermline music scene for many years. It also offers many club nights such as “Harlem” Life and Urban with DJ’s and late nights available every weekend. Dunfermline has always had a strong connection with music. Well known names such as Barbara Dickson – Ian Anderson (Jethro Tull) Nazareth – The Skids and Big Country. Dunfermline forms part of the Kingdom of Fife Millenium cycle ways. Fife has about 300 miles (500km) of cycle routes along quiet country lanes, disused railway lines and forest tracks. The Fife Costal Path caters for those who prefer to walk. The path can be done in bite size chunks or as a long distance route. You can walk from village to village. Picturesque fishing villages watch seals basking in the sun and look out for dolphins as they play off the coast. The world famous Knockhill Racing Circuit is only 6 miles from here. It is famous for hosting the top racing events in the UK, The British Touring Cars, British Superbikes and the Scottish Motor Show. 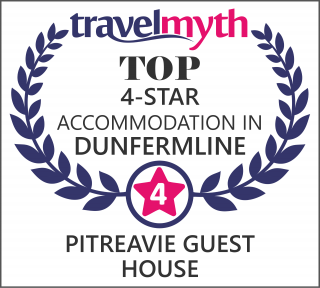 There are three courses in Dunfermline – Pitreavie golf Club which is just a 4 minute walk from here. Dunfermline Golf Club which is a 10 minute drive from here and Canmore Golf Club which is also a 10 minute drive from here. St Andrews – a 45 minute drive from here has 9 courses including the Old Course. More information can be found at the Scottish Tourist Board’s golf website. Edinburgh is 13 miles from Dunfermline, connected by road and rail network. Form our guest house the bus stop is a 2 minute walk away. The railway station is about a 10 minute walk. Edinburgh has a wealth of activities and places to visit includingEdinburgh Castle with its one o’clock gun. Edinburgh Old Town, St Giles Cathedral, Holly Rood House Palace. Rosslyn Chapel and Craigmillar Castle. Museums include The Museum of Scotland, The Royal Museum of Scotland, The Museum of Childhood, Huntly House, Scottish Mining Museum, The Museums of the Royal College of Surgeons. If art is your interest then Edinburgh has the very finest Art Galleries including The Royal Scottish Academy, The Scottish National Portrait Gallery, The Scottish National Gallery of Modern Art, The National Gallery of Scotland. There are many other world class attractions including Dynamic Earth, Edinburgh Zoo, The Royal Botanic Gardens, Edinburgh Dungeon, Royal Observatory, Arthurs Seat, Royal Yacht Britannia, Scottish Parliament, Greyfriars Bobby. Edinburgh also plays host to numerous festivals during the year. The Edinburgh festival in August is complemented by the Fringe. The Science Festival is held in Spring and at New Year festivities last for days with the Hogmany Street Party providing the highlight.